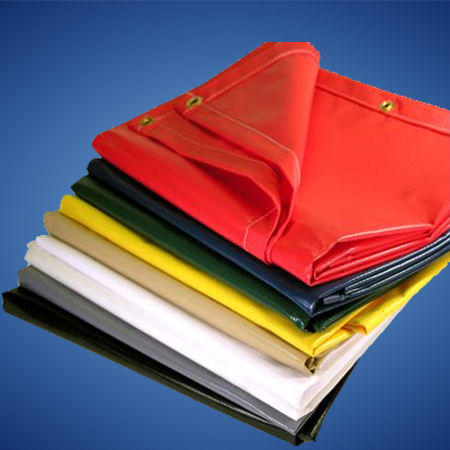 Tarpaulin, generally known as tarp, is a large sheet of strong, flexible, water-resistant or waterproof material, made of plastics such as polyethylene or Polypropylene. Inexpensive modern tarpaulins are made from woven fabric of High Density Polyethylene and then coated with Low Density Polyethylene on single or both side to make it water-resistance or waterproof. Tarpaulins often have reinforced grommets (usually Aluminum eyelets) at the corners and along the sides to form attachment points for rope, allowing them to be tied down or suspended. When treated against ultraviolet light, these tarpaulins can last for years exposed to the elements. Tarpaulins multiple use includes providing shelter from the natural elements, i.e. wind, rain, or sunlight or as a ground sheet or a fly in camping, a drop sheet for painting, for protecting the infield of a sports arena, and for protecting rail wagons carrying materials or wood piles. Polyethylene tarpaulins have proven to be a popular source to procure an inexpensive, water resistant fabric. Water and UV-resistant, good weather ability. High tensile strength and do not cause any adverse environmental effects. Designed for extreme outdoor use. Good flexibility, easy handling, excellent tensile strength and tear strength. Economical, easy to transport and sustain long time for good performance. Excellent choice for the truck tarp industry. Resistant to mildew and chemicals. Excellent resistibility to Agro-chemicals like phosphorus, ammonia, sulfur.